Grubhub is an online and mobile platform for restaurant pick-up and delivery orders. In 2018 the company connected 95,000 takeout restaurants in over 1,700 U.S. cities and London. The Grubhub business model comprises a portfolio of brands like Seamless, LevelUp, Eat24, AllMenus, MenuPages, and Tapingo. The company makes money primarily by charging restaurants a pre-order commission, and it generates revenues when diners place an order on its platform. Also, it charges restaurants that use Grubhub delivery services and when diners pay for those services. What is Grubhub value proposition? Why is the value proposition so compelling for restaurants? How does Grubhub make money? At the time of this writing, Grubhub comprises a portfolio of brands that includes Grubhub, Seamless, LevelUp, Eat24, AllMenus, MenuPages and Tapingo. The company was founded in 2004, and it merged with Seamless – founded in 1999 – in 2013. Grubhub has been able to grow substantially following the merger with Seamless and aggressive acquisitions of other brands. The value and ability to grow its business highly depend on Grubhub ability to keep offering a compelling value proposition for those two key partners. The value proposition changes according to the key partner Grubhub is able to reach with its services. Indeed, the Company has a powerful two-sided network that creates value for both restaurants and diners. Therefore, it is critical to distinguish between the value proposition offered to those two partners. Grubhub has been able to deliver a unique value proposition for restaurants, as it generates higher margin takeout orders at full menu prices. Indeed, for restaurants, the takeout is a way to grow their business without adding seating capacity or staff. Also, being able to promote takeout is expensive, inefficient and its success can’t be tracked. Thus, Grubhub is offering a risk-free service to restaurants to grow their business. In contrast, restaurants can track orders on the platform quite efficiently, by connecting restaurants with local diners with the least effort and best match. This is a compelling value proposition for restaurants. But there is even more to it. Therefore, Grubhub has packaged a low-risk, high-return solution which is highly efficient, trackable and it carries no upfront cost, neither a subscription fee. Diners get what Grubhub defines a “direct line” into the kitchen, avoiding inefficiencies, or frustrations associated with paper menus and phone orders. When Grubhub designed the value proposition for diners, it did so by keeping in mind that the traditional takeout ordering process is often frustrating, while Grubhub has designed its platform to make the user experience as frictionless and rewarding as possible. This, in turn, help diners shop more frequently, and restaurants monetize more from continued and repeated business. Grubhub business model is based on charging restaurants a per-order commission that is primarily percentage-based. In some markets, Grubhub provides delivery services to restaurants on its platform. The Company also generates revenues when diners place an order on its platform. Restaurants can choose their level of commission rate, at or above the base rate. A higher commission rate allows the restaurants to have a higher exposure to diners on the platform. Also, restaurants use Grubhub delivery services pay an additional commission. Fees are also charged to the diners for delivery services it provides. Grubhub usually remits net proceeds to the restaurants on at least a monthly basis. The company has been able to grow consistently over the years thanks to marketing activities, acquisition, improved platform via its technologies. We’ll look more in detail to its marketing and acquisition activities. According to SimilarWeb Grubhub is the fourth most popular site in the US for restaurants and delivery, in the food and drink category with over sixteen million visitors each month. Also, according to Alexa, the platform has quite good engagement metrics which show a good user experience. 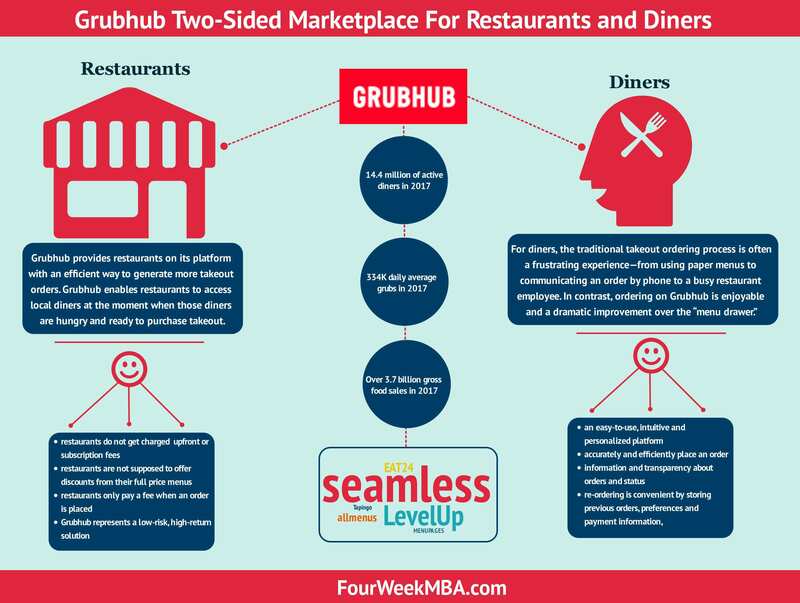 Of those platforms, seamless.com and eat24.com are part of the Grubhub brand portfolio. On October 2017, Grubhub acquired eat24, llC (“eat24”), a wholly owned subsidiary of yelp inc. The main institutional investors that have an equity stake higher than 5% as of 2018 are Caledonia, Baillie Gifford & Co., The Vanguard Group, T. Rowe Price Associates, BlackRock, Carmignac Gestion, and PAR Investment Partners.